At the beginning of each school year, the allocation process for special religious education (SRE; scripture) becomes an issue for parents, caregivers and schools. As seen in a recent Sydney Morning Herald article regarding Maclean High School procedures for opting out are often not applied properly. More often than not, poor compliance with policies and procedures comes at the expense of the rights of students and parents belonging to minority faiths and those who have non-religious beliefs. In consideration of the self-regulatory nature of scripture in NSW, schools should ensure that students are properly categorised and placed in the right class based on information provided to the school by parents and caregivers. The religious education to be given to children of any religious persuasion is to be given by a member of the clergy or other religious teacher of that persuasion authorised by the religious body to which the member of the clergy or other religious teacher belongs. The main way the school identifies the religious persuasion of a child is using the information provided in the Application to enrol in a NSW Government school (the enrolment form). 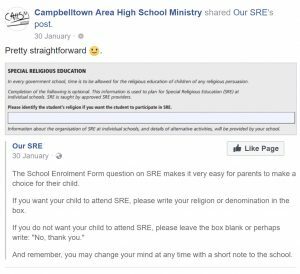 It is concerning when it becomes evident that religious organisations involved in SRE in NSW public schools either do not understand the Department’s enrolment procedures for SRE or intentionally misrepresent them. 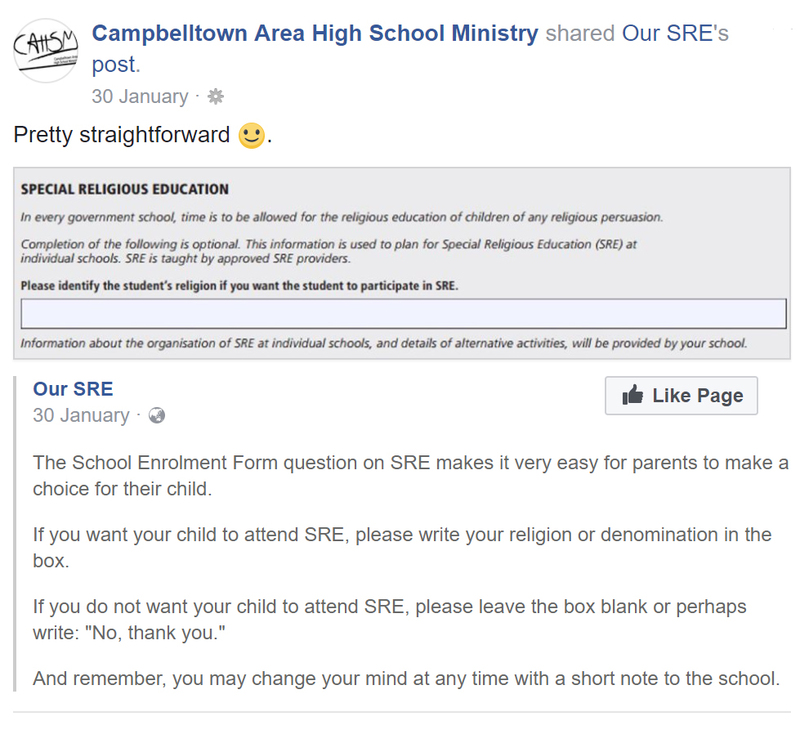 One worrying example is a Facebook post published on 30 January 2018 by ourSRE, a Generate Ministries support program for SRE instructors and ‘combined arrangements’ (a group of churches coming together to offer SRE). 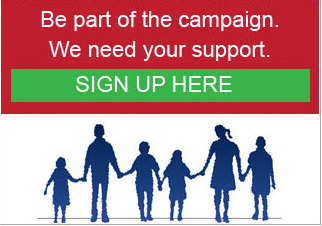 Parents and caregivers deserve better information than what ourSRE and CAHSM seem prepared or able to provide. So let’s have a look at the ourSRE post: what it says about enrolling a child in SRE is, prima facie, correct. Where a religious persuasion was nominated on enrolment, the student is enrolled in a special religious education class of the religious persuasion identified on the student’s enrolment record. If a parent writes a religious persuasion, for example, Baha’i, or a denomination, such as ‘Baptist’, in the lilac box, and that religious persuasion or denomination is available as an SRE option at the school, students are to be placed in the appropriate SRE class. That is, if ‘Baha’i’ is written and Baha’i SRE is available, the student should be enrolled in that class, or if ‘Baptist’ is entered and Baptist SRE is an available option at the school either by a single SRE Baptist SRE provider or as part of a combined arrangement of which a Baptist SRE provider or authorised church is a member then the student should be placed in that SRE class. 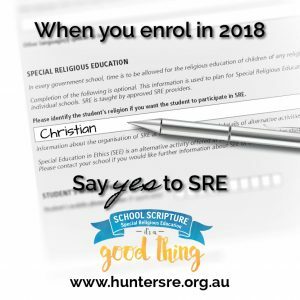 However, if Baha’i or Baptist SRE are not available options at the school, including if a Baptist SRE provider is not part of a combined arrangement providing SRE at the school, or if a parent writes ‘Christian’ (as suggested by HunterSRE below), the child should not be placed in any SRE class on the basis of the enrolment form. That parents need to provide the school with specific information about the religious persuasion or denomination of the child, or provide separate written consent for their child to attend the SRE provided by another religious persuasion, is made clear in the context of combined arrangements. This means that if a combined arrangement is only made up of a few providers, only students who have the religious persuasion (ie. denomination) of those providers declared on their enrolment form should automatically be placed in the SRE class provided by that combined arrangement. For example, the combined arrangement at Maclean High School is only made up of Baptist and Presbyterian providers, so only students who have ‘Baptist’ or ‘Presbyterian’ on their enrolment form should automatically be placed in the SRE class run by the SRE instructor employed by the combined arrangement. Combined arrangements are very specific and children that are not of the religious persuasions part of the arrangement should not be dumped in classes provided by such combined arrangements for any reason, such as administrative and logistical convenience. There are 20+ Christian religious persuasions on the Department’s list of approved providers and a combined arrangement could be 2 or more of any of these and differ from school to school. Where …the nominated religious persuasion is not available as a special religious education program at the school, parents/caregivers are asked to complete a special religious education preference form which outlines all special religious education options available at the school. Parents/caregivers have the right to choose any of the special religious education options available or to choose nonspecial religious education. and given that principals should not make any assumptions about a parent or caregiver’s wishes, if a religious persuasion is written which has more than one denomination providing SRE in NSW Government schools, for example, ‘Christian’, the parent or caregivers should be sent the ‘special religious education preference form’. The template ‘sre preference form/letter’ made available by the Department is available here. Let’s now consider ourSRE‘s advice to parents who do not want their children to participate in SRE. OurSRE seems to be saying that if a parent or caregiver does not want their child placed in an SRE class, it is simply a matter of leaving the box blank or writing something like ‘No, thank you’. But it is not as simple as that, and ourSRE should, or do, know it is not. 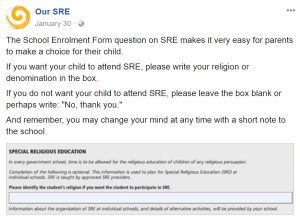 Where a religious persuasion was not nominated on enrolment…parents/caregivers are asked to complete a special religious education preference form which outlines all special religious education options available at the school. So what ourSRE fails to mention is that if the box on the enrolment form is left blank despite parents and caregivers being told that filling it in is optional, parents should be sent the ‘SRE preference form’. Even if a parent or caregiver writes ‘no religion’ in response to the request on the enrolment form ‘Please identify the student’s religion if you want the student to participate in SRE’ schools are instructed to send those parents and caregivers the ‘SRE preference form’, thereby giving SRE providers a second bite of the cherry. Now this is where it gets very interesting and what follows might be the very reason why ourSRE want to make it seem simple to parents and caregivers. 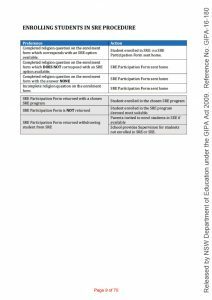 There is no clear direction by the NSW Dept of Education to schools on what is supposed to happen if the SRE preference form/letter is not returned, is returned blank, or without clear parental directions. Where a religious persuasion was not nominated [on enrolment], the student is placed in alternative activities. but it was removed in December 2014 and since August 2015 the Department has been asked to fill this gap in policy and they have chosen not to. Furthermore, the minutes of the Department’s Consultative Committee for Special Religious Education (the Committee) make it very clear that the religious organisations on the Committee want students who do not return the SRE preference form or return it blank, placed in the SRE class ‘deemed most suitable’ (see image below). 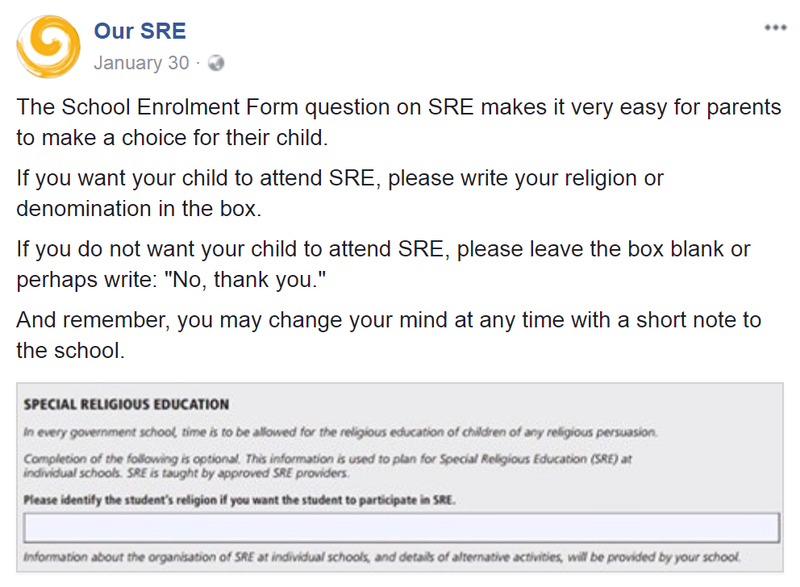 The enrolment process is now a game of ‘guess or simply assign a religious persuasion’ and put a child into SRE without the consent of the parent! So it seems the Minister and his Department are content to allow a situation geared towards maximising the numbers of students in SRE without explicit parent consent even if that means breaching Section 32(2) of the NSW Education Act 1990. The last thing we want is kids in classes whose parents don’t want them there. and this is why FIRIS declares the ourSRE post a deliberate fail to tell the whole story.